In the midst of a grueling campaign for the Republican nomination for U.S. Senate, Alabama’s political sweet tea has acquired a distinctly sour taste. Appointed incumbent Sen. Luther Strange (R) finds himself in a vulnerable position against former Alabama Supreme Court Chief Justice Roy Moore (R) in the party’s primary runoff election, which will take place on Tuesday (Sept. 26). Running as an outsider, Moore hopes to once again rebuke the political establishment by upending Strange, the preferred choice of GOP leaders in the nation’s capital. The two candidates arrived at this point by finishing in the top two spots in the Aug. 15 primary. But Alabama, like some other southern states, requires a primary runoff election between the first and second-place primary finishers if no candidate wins a majority of the initial vote. Moore finished first in the primary with 39% while Strange trailed him with 33%. The runoff victor will face former U.S. attorney Doug Jones (D) in the Dec. 12 special general election, which was precipitated by President Donald Trump’s appointment of then-Sen. Jeff Sessions (R) as Attorney General of the United States. Not for the first time, an Alabama special Senate election has grabbed the public’s attention. The candidates and their allies aren’t pulling any punches. Echoing the rhetoric of the 2016 election cycle, both sides want to make the other look like part of the political “swamp,” either in Washington or in Montgomery, Alabama’s capital. Moore recently attacked Senate Majority Leader Mitch McConnell (R-KY), who is supporting Strange, for trying to perpetuate the “Washington Swamp,” and a group backing Moore has an ad out that says “Judge Roy Moore isn’t the DC Swamp’s choice, but he is Alabama’s choice.” That largely sums up the attack side of the Moore campaign, though he has also touted his military background and conservative stances while serving as the state’s chief justice. Polling in the runoff contest is surely keeping Republican leaders in Washington up at night. In an average of polls taken since Sept. 6, Moore holds about a 10-point lead over Strange, 48%-38%. None of the surveys taken in September are particularly satisfying from an analyst’s perspective: Two come from sources with horses in the runoff race — Voter Consumer Research polled for the Senate Leadership Fund, which backs Strange, and Time for Choosing is a pro-Moore PAC — while the other four surveys all have potential methodological issues — JMC Analytics and Emerson College only called landlines while Strategic National asked a question that may have primed voters to back Moore before asking about the horse race. Additionally, while the Strategy Research poll had a large sample size, it was done in one day and was of likely Republican voters who had cast a least one Republican primary vote in the past five years, which might draw from too large a voter universe. Notes: *Voter Consumer Research polled on behalf of Senate Leadership Fund, which is backing Strange, and Time for Choosing is a pro-Moore PAC. The JMC Analytics poll is the version that included those leaning toward Moore or Strange — without leaners, it found Moore ahead 47%-39%. Although Moore leads public surveys and may be a small favorite, remember that 28% of the primary vote went to candidates who didn’t advance to the runoff. In light of that reality and the unsure polling, caution is in order. Many factors have helped shape the race, and the final few days could see additional newsworthy developments. For instance, Moore and Strange are scheduled to debate on Thursday with no moderator or timekeeper — otherwise known as a “Lincoln-Douglas-style” debate. In April, new Alabama Gov. Kay Ivey (R) issued a proclamation to shift the special election from November 2018 to December 2017, undoing the original schedule set by former Gov. Robert Bentley (R). Had Bentley’s timeline remained in place, Strange would have had a year or so to cement his status as Alabama’s junior senator before campaigning started in earnest. Instead, he’s essentially been in the electoral field of fire since entering office. Strange has had to fend off questions about the nature of his February 2017 appointment to the seat by Bentley while facing attacks claiming that he’s DC’s pick for Alabama. Serving as Alabama’s attorney general, Strange led the office charged with investigating Bentley, who eventually resigned the governorship after pleading guilty to campaign finance law violations. Some claim Strange slowed the state legislature’s efforts to impeach Bentley when it became more likely that Sessions would be appointed to incoming President Donald Trump’s Cabinet, which created a Senate vacancy that Strange coveted. As an appointed incumbent, Strange was never going to be as safe a bet to win renomination as an elected one — since the start of popular elections for the Senate, 94% of elected incumbents have won renomination versus 80% of appointed incumbents — and the nature of his appointment to the Senate has not helped him. A major question in the race is the importance of President Trump. While he endorsed Strange in the primary, there isn’t much evidence that it jump-started the appointed incumbent’s campaign, given the 33% result for Strange in the primary. Trump is scheduled to campaign for Strange in Huntsville on Friday before the runoff. Considering the location — Huntsville (Madison County) formed the base of Rep. Mo Brooks’ (R, AL-5) support during the primary, where the congressman finished a distant third — and the more conservative and rural makeup of Moore’s support, perhaps Trump’s visit could shift some votes from Moore to Strange or convince a few more in the rank-and-file to show up for Strange. (More on demographics and election patterns below). Vice President Mike Pence will also make an appearance on the campaign trail the day before the election to help Strange. While Strange has the president, the vice president, and the Senate majority leader, Moore does have a few of his own friends. Brooks opted to endorse Moore instead of Strange, possibly as payback for the attack ads the SLF ran against Brooks in the primary, and Brooks’ House Freedom Caucus colleague Rep. Mark Meadows (R, NC-11) also backs Moore. Notably, former White House chief strategist Steve Bannon came out in support of Moore despite Trump’s endorsement of Strange. Bannon views Moore’s candidacy as a possible precursor to successful insurgent challenges to sitting Republican senators in 2018 Senate primaries, a nightmare scenario for McConnell. As an anonymous Republican senator told Politico last Sunday when asked about Moore becoming a senator, “It’s highly likely that he could be disruptive. We’re talking about somebody who has been removed from the bench twice.” First elected in 2000 to be chief justice of the Alabama Supreme Court, Moore was removed from the post in 2003 after disobeying a federal court order to take down a monument to the Ten Commandments. He won the chief justice position again in the 2012 election, but was suspended in 2016 after he continued to direct state judges to enforce Alabama’s gay marriage ban despite the U.S. Supreme Court’s decision to overturn the ban. Understandably, Moore is popular with conservative, evangelical Christians, and has also captured the support of traditionally pro-Trump organizations, including Breitbart News. The first round of voting on Aug. 15 saw Moore edge Strange 39%-33%. While it is impossible to know just what turnout will look like on Sept. 26, we know that 28% of the primary vote went to candidates other than Moore and Strange. Most of the other vote went to candidates from the extreme north and south of the state: Brooks (20%) from AL-5 along the northern border of the state, and state Sen. Trip Pittman (7%) from a state senate district east of Mobile in Baldwin County in the southwest corner of the state. Regardless of how many of those non-Moore-or-Strange voters show up, how they vote will be important. Map 1 below shows three cartograms of the county vote in the primary, with each county sized by its share of the vote in the primary. They detail where Moore and Strange performed best, and where the combined vote of the other candidates in the primary was largest. Notes: Results are unofficial. Counties are sized by their share of the overall primary vote. Overall, there were 10 counties where candidates other than Moore or Strange won at least 30% combined, and 30 counties (Alabama has 67) where the rest of the field won at least 20%. 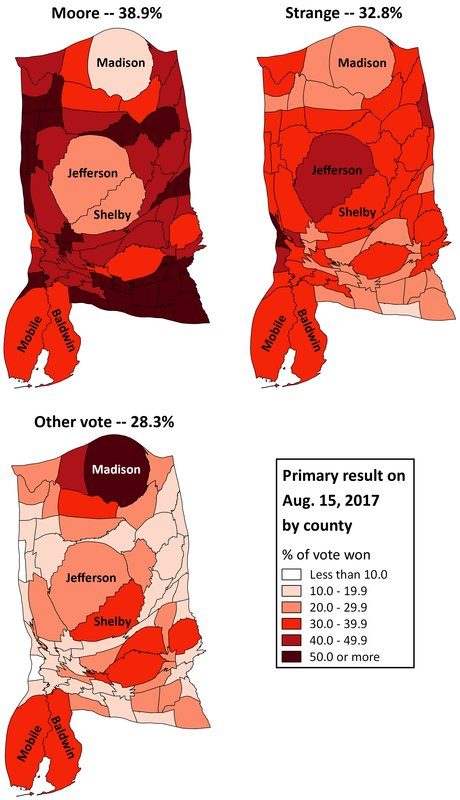 Importantly, four of the five counties with the largest share of the vote in the primary fall into the first category: Madison (Brooks’ home voted 54% for candidates other than Moore and Strange), Baldwin (38%), Shelby (31%), and Mobile (31%). The fifth of those five counties, Jefferson County — home of Birmingham and the largest county in the state — had 29% of its vote go to other candidates. Of the nearly 120,000 votes cast for candidates not named Moore or Strange, almost exactly half came from these five big counties. As Table 2 below shows, although the other 62 counties in the state accounted for about three-fifths (62%) of the total primary vote, the five biggest counties in terms of vote share accounted for half of the vote for candidates other than Moore or Strange while providing about 38% of the total vote. Using the 2015 American Community Survey five-year estimates — the most recent census estimates to have data for all counties — I looked at the education level of the non-Hispanic white population in Alabama by county and how it related to the primary vote. Like much of the Deep South, Alabama’s voting is racially polarized, so the breakdown of the white population is relevant to the GOP primary because few black voters cast Republican ballots. Notably, there was a strong .72 correlation between Moore’s primary vote share by county and the share of a county’s white population that had less than a bachelor’s degree. That is, as the share of the white population with less than a bachelor’s degree grew, the greater Moore’s vote share tended to be. Remember, this was the demographic — whites without college degrees — that arguably powered Trump to the presidency. Overall, about 52% of the variation in Moore’s vote could be explained by the relative education level of the white population. This isn’t a unique pattern in Moore’s electoral career: In both the 2006 and 2010 Republican gubernatorial primaries, the correlation between Moore’s county vote share and the share of whites with less than a bachelor’s degree was above .60. Turning back to the 2017 Senate primary, Moore’s greater reliance on rural voters was also evident as his county vote share was inversely related to county size by population, with a -.66 correlation. Conversely, the correlation between Strange’s vote share and the share of the white population with less than a bachelor’s degree was about 0 (-.04), and a slightly positive but very weak .15 with the size of a place. While not as strong, there is also some correlation (.41) between Trump’s performance in the 2016 presidential primary and Moore’s county-level vote share in the Aug. 15 primary. That is, Moore tended to do better where Trump did better. Meanwhile, there is again almost no relationship between Strange’s performance and this measure (Trump’s primary percentage). Given Moore’s anti-establishment bona fides, Trump’s appeal among the white working-class in the 2016 election, and the strongly positive correlation between the share of whites with less than a bachelor’s degree and Moore’s success in the primary, it would not be a stretch to say that Moore is seemingly the more Trump-like candidate despite the fact that Strange has Trump’s backing. So what might these different observations mean for the runoff? A substantial chunk — half — of the primary vote cast for other candidates besides Moore and Strange came in the five counties with the largest share of the GOP primary vote. 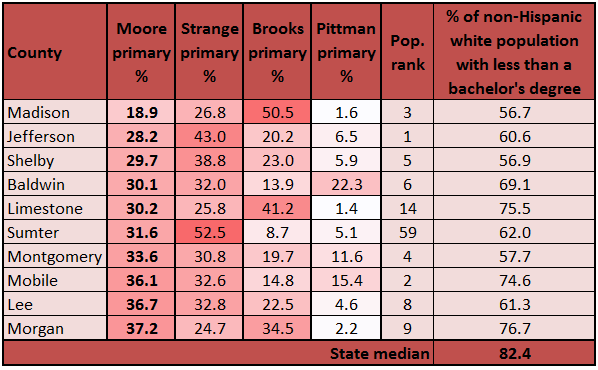 Those also happened to be five of Moore’s 10 worst counties, as laid out in Table 3 below. As the table indicates, eight of Moore’s 10 worst counties also happened to be among the 10 biggest in the state by population, reflecting the negative relationship between county size and Moore’s vote share noted above. Additionally, the share of whites with less than a bachelor’s degree in each of these counties was well below the state median of 82.4% (to reiterate, this is out of just the non-Hispanic white population, so the county median for the percentage with at least a bachelor’s degree is 17.6%). The smaller and less-well educated a place is, the better Moore tended to do. Sources: Unofficial results from the Alabama Secretary of State; population rank based on 2016 census population estimates; percentages of non-Hispanic whites with less than a bachelor’s degree based on 2015 American Community Survey five-year estimates and is based on just the non-Hispanic white population, not as a percentage of the overall population. It is possible that Strange could either improve markedly in some of these places — such as Madison County, where Brooks won a slight majority — or make further inroads with Brooks and Pittman off the ballot, like in Baldwin and Mobile counties, Pittman’s home turf. Madison seems particularly ripe on paper, seeing as it has the most educated white population of any county in the state, but it’s also Brooks’ territory, and the anti-establishment congressman has thrown his support behind Moore. It’s also worth noting that Madison’s share of the runoff vote will almost surely drop compared to its share of the primary vote (9.1%) because Brooks won’t be on the ballot, meaning the “friends and neighbors” effect that helped boost relative turnout there will no longer be operative. As a reference point, Madison’s average share of the GOP primary vote in the past three presidential primaries is 8.0%. Jefferson County could be helpful to Strange as well, as could Shelby County, which is next door to Jefferson. Moore won a little less than 30% in both of these central Alabama counties, which encompass much of the Birmingham metropolitan region, so Strange could build on his primary edge in both in the runoff. Together, Jefferson and Shelby had about the same number of non-Moore/Strange votes as Madison did. However, in the counties with greater than the median share (82.4%) of whites without a bachelor’s degree, Moore won 50% of the vote. And he won a solid plurality (46%) in counties where at least 70% of whites lacked a bachelor’s degree, which collectively made up 60% of the total vote. And based on population size, Moore won 47% of the vote in the 55 counties with fewer than 100,000 people while staying roughly even with Strange in the rest of the state (Strange won 34% in the 12 counties with more than 100,000 people, Moore 32%). If raw turnout were to stay about the same from primary to runoff — unknowable, but more on that momentarily — here’s some back-of-the-envelope runoff math: If Moore and Strange won all the same voters that they won in the primary, Moore would then only have to win 35% of the votes cast for candidates who didn’t make the runoff in counties with more than 100,000 people and 50% of those votes in the counties with fewer than 100,000 people to win the runoff by roughly 1,000 votes. Having won six points more than Strange in the primary, Moore doesn’t have to garner quite as many more extra votes as Strange to reach the magic 50%+1 mark to win the runoff. At present, eight states in the South (or Greater South) use primary runoff elections: Alabama, Arkansas, Georgia, Mississippi, North Carolina, Oklahoma, South Carolina, and Texas. All but North Carolina require a candidate to win an outright majority in the initial primary to avoid a runoff (the Tar Heel State moved to requiring just 40% or more in 1989). Florida temporarily banned primary runoffs in 2002 and then did away with them in 2005. While South Dakota and Vermont have primary runoff rules for U.S. Senate primaries, they have never been employed. That means that only the nine southern states (including Florida) have ever used primary runoffs for Senate. Overall, there have been 89 Democratic or Republican primary runoffs for U.S. Senate going back to 1916, when Texas became the first state to employ a true runoff for Senate (some other states used instant-runoff-like systems for a few years in the early 20th century). These 89 contests do not include primary runoffs for concurrent special elections, of which there have been three, because they were special elections only for a few remaining months of a term while a concurrent election was happening for a full term. Given the South’s long history as a solidly Democratic region, 70 of the primary runoffs have been Democratic contests while 19 have been Republican ones. In terms of turnout shift from primaries to runoff elections, it might seem more likely than not that the 2017 Alabama Republican runoff will have lower overall turnout than the primary did. In 73 of the 89 historical cases, the runoff election had lower turnout than the primary, though that decline ranged from just -0.6% in the 1924 South Carolina Democratic primary to -89% in the 1968 North Carolina Republican primary. Now, outside events can influence such changes. In some cases, a party held a Senate primary on the same date as a presidential primary. Unsurprisingly, the runoff election in those instances had lower turnout because it didn’t have a concurrent presidential contest driving out voters. But on the whole, median turnout declined 16% from the primary to the runoff in these 89 primary runoff elections. In an odd-year special election, it wouldn’t be stunning to see the same thing happen in Alabama. However, this is only the second time that there has ever been a primary runoff for an odd-year Senate special election. The only other instance was the 1941 South Carolina Democratic primary for Senate. President Franklin Roosevelt appointed Sen. James Byrnes (D-SC) to the U.S. Supreme Court, creating a vacancy. As winning the Democratic primary was tantamount to winning the general election, the special election primary attracted a great deal of attention as well as three strong candidates: sitting Gov. Burnet Maybank (D), former Gov. Olin Johnston (D), and Rep. Joseph Bryson (D, SC-4). In the primary, 124,570 votes were cast and Maybank won a plurality with 47%. Facing Johnston in the runoff, Maybank won with 57% of the 162,787 votes, a turnout increase of 31%. Given the amount of attention being paid to the Alabama race in ads, money, and media coverage, seeing a turnout bump would also not be shocking. Just consider evidence from a recent GOP Senate primary that had similarities with the 2017 Alabama edition: In 2014, Mississippi’s raucous Republican primary for U.S. Senate also featured an establishment incumbent, Sen. Thad Cochran, and an anti-establishment insurgent challenger, state Sen. Chris McDaniel. McDaniel narrowly edged Cochran in the primary 49.5%-49.0%, but Cochran won the runoff 51.0%-49.0%. Still, Cochran was a long-time incumbent first elected in 1978, which is certainly different from Strange’s situation. Nonetheless, there are parallels, and turnout in the Mississippi runoff went up 20% over the initial turnout in the primary. As an incumbent who faces a primary runoff, Strange is certainly battling history. Of the 89 primaries that went to a runoff, 30 involved incumbents (25 elected and five appointed). Table 4 lays out the 30 primary elections involving an incumbent that went to a runoff and Strange’s position based on his percentage of the primary vote. Incumbents who finished first in the initial primary are in green while incumbents who finished second are in yellow. The four incumbents who finished outside the top-two spots and failed to make the runoff are in red. As the table shows, only 13 of the 30 incumbents went on to win the runoff, and not a single appointed incumbent won. These data have a small sample size, but they won’t reassure Strange’s backers. Notes: *Denotes an appointed incumbent. Names shaded green finished first in the initial primary, those in yellow second, and those in red failed to advance to the primary runoff. “W” signifies that the incumbent won renomination and “L” signifies that the incumbent lost in either the primary or the primary runoff. 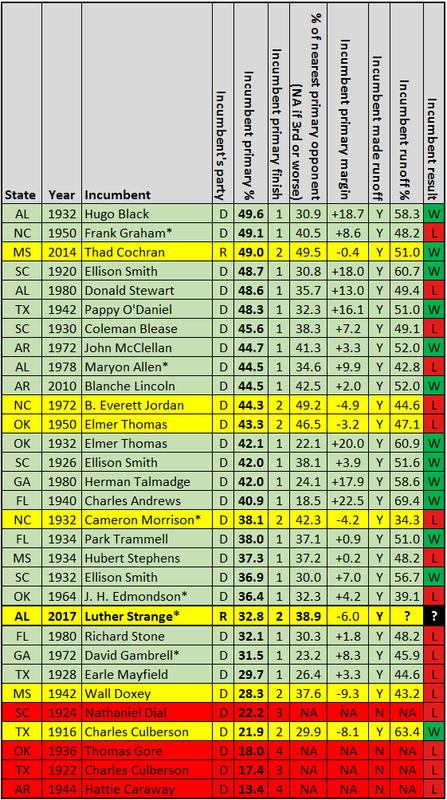 On top of the poor electoral history for appointed incumbents in primary runoffs, Strange’s 32.8% primary showing is one of the lowest for any incumbent senator involved in an election that went to a runoff. Only Sen. Charles Culberson (D-TX), in 1916, won after winning a lower percentage in the primary (21.9%) than Strange. Culberson wound up winning his runoff election rather easily: The primary vote was heavily fragmented (four candidates won at least 15%) and supporters of the failed primary candidates rallied to Culberson in the runoff in part because his opponent, ex-Gov. Oscar Colquitt, was at odds with President Woodrow Wilson’s administration. In 2017, Strange finds himself in his party’s president’s camp, but seemingly at odds with many of the supporters of said president. What a curious state of affairs, indeed. Moore has led every primary runoff poll since he finished first in the Aug. 15 primary, and he appears to be a slight favorite. However, a party primary with unpredictable turnout is an uncertain beast. Strange has far more resources and could surprise Moore in the end. A large share of the vote that went to candidates other than Moore or Strange in the primary is situated in counties that could be friendlier to Strange if demographics are any guide. But based on the history of incumbent performance in primary runoffs, Strange is not in a great position, and he is definitely playing catchup. Yet there is one other aspect to this race to consider: While President Trump and Senate Majority Leader McConnell have struggled to work together and have a strained relationship, they do share one common goal: electing Strange. Could the late push by the president and vice president and the all-out attack ads funded by McConnell’s Senate Leadership Fund put Strange over the top next week? We certainly aren’t going to write him off.